For the first nomination of his incoming administration, Governor-elect Greg Abbott has tapped Cameron County Judge Carlos Cascos to be the next Texas Secretary of State. In Texas, the office oversees state elections, but also serves as the governor’s chief adviser on border and Mexican affairs. Cascos will also be the state’s Chief International Protocol Officer. Given the way border security and immigration has dominated the political climate in Texas this year, Cascos is likely to play an important public role in the Abbott administration. It’s no coincidence that Cascos was originally born in Matamoros, Mexico, is a longtime South Texas resident and has served on the Texas Border Security Council. Announcing the nomination, Abbott said Cascos will “inspire the next generation of Hispanic leaders,” and pending the senate’s approval, would work to promote the governor-elect’s vision of the Rio Grande Valley as vital to the economic success of the rest of the state. The appointment is also a symbolic gesture from the Abbott administration, aimed at least in part at bringing more Hispanic voters into the GOP’s base. Cascos’ parents immigrated to the U.S. when he was a child, and the family pursued legal paths to citizenship when he was still young. As a Democrat, he served as a South Texas county commissioner for three terms in the 1990s, before switching parties in 2006 when he was first elected judge of Cameron County. In an extended conversation with Marfa Public Radio, Cascos revealed himself to be in ideological lock step with the Texas GOP on a variety of issues, from border security and immigration to government involvement in the economy. “Public safety and securing our border is critical to securing our economic development,” Cascos said at a press conference on his appointment, summing up his thoughts on the issue. “I can tell you from personal experience what the lack of border security has done,” Cascos told KRTS. He said commerce between the U.S. and Mexico through Cameron County’s international ports has dropped because of violence – or the perception of violence – on the Mexican side. He describes those crossings as the “economic engine” that drives the region’s growth. Still, some community leaders in South Texas say that perception of the border as an inherently violent place – or in the politically costly words of Abbott, one resembling the “third world” – comes from the expansive law enforcement presence in the region. 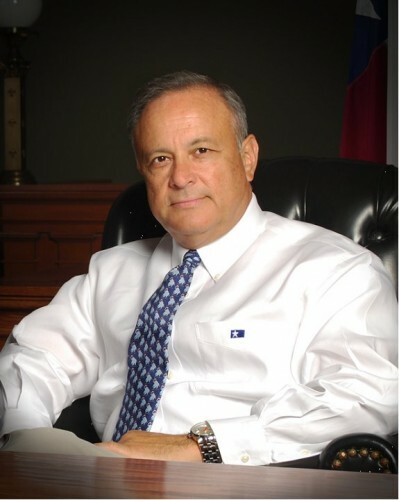 Former Laredo Mayor Raul Salinas was one prominent critic of Governor Perry’s National Guard deployment. Cascos says local law enforcement in his part of the borderlands is in constant need of assistance, often from Homeland Security grant programs like Operation Stonegarden. But some border authorities aren’t happy with the way that money’s being spent. West Texas sheriff Rick McIvor, the current head of the state-funded Texas Border Sheriff’s Coalition, has argued more state money should go to local departments instead of to state troopers or National Guard troops deployed to the border. He also dismissed the effectiveness of the National Guard deployment. Cascos says he’ll take a fresh look at that rift in the law enforcement community to try and find common ground. As President Obama considers his options for an immigration overhaul through executive action – a move that Governor-elect Abbott has said would be unconstitutional – Cascos said he would “absolutely” support an Abbott-backed lawsuit against the president to try and block the effort. Still, Cascos said he does hope leaders can work past the partisanship. In his position as senior border advisor, Cascos said he’ll work to promote the economic advantages the border region has to offer. “Former governor Ann Richards said way back then, that the border was the front door to the United States, and not the back door,” he said. “Mexico is a huge trading partner for Texas, and we have to nurture those relationships. The arrival of Space X to the region was a much-touted success story of Texas’ small government, big-tax-incentives approach to luring in business. Cascos said bringing more investors to the region depends on the state making its own investments in the Rio Grande Valley. Fronteras Desk correspondent Lorne Matalon joined us for this conversation. This entry was posted in Talk At Ten and tagged Border Issues, Border Security, Cameron County, Carlos Cascos, Economy, Greg Abbott, Immigration, Rio Grande Valley, South Texas, Texas Politics, Texas Secretary of State, US-Mexico Border. Bookmark the permalink.